OO scale two-rail DC. State-of-the-art highly detailed model, interior details and Hornby latch couplers. New in original box with instruction sheet and add-on details. OO scale two-rail DC. State-of-the-art highly detailed model, cab details, sprung buffers, and Hornby latch couplers. May be operated in DCC or conventional modes. New in original box with instruction sheet and add-on details. 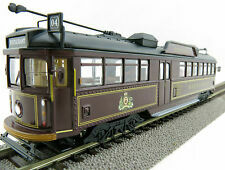 1:76 DIECAST MODEL OF A W6 CLASS TRAM RUNNING IN BENDIGO AS A RESTAURANT TRAM. Model does not have a motor ! Item are listed with GST included. GST is not applicable to international orders. A fully detailed model of a W6 Melbourne. HO/OO gauge or 1:76 scale. This model depicts the Restaurant tourist tram 'No. 938' - known as the "Bela Tram". Fully working ELECTRIC model with interior lighting and bi-directional working headlights. Outstanding packaging. SCALED SPEED TO 50 KPH. There are only 400 pieces made worldwide. 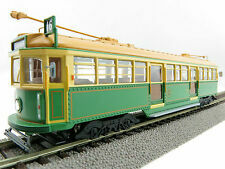 A fully detailed model of a W6 Melbourne Tram THE "GREEN RATTLER". HO/OO gauge or 1:76 scale. MMTB VERSION Car NO. 975 The Met . Fully working ELECTRIC model with interior lighting and bi-directional working headlights. Outstanding packaging. SCALED SPEED TO 50 KPH. There are only 400 pieces made worldwide. THE BOGIES ARE TURNING AND THE WHEELS WILL FIT ON OO/HO TRACK. Models feature coupler pockets that allow the user to switch couplers to any type of coupler that is available in NEM pocket type (i.e. Kadee, Roco, Fleischmann, or others). This item is not a toy but rather a highly detailed static model designed and produced for collectors. This item is not a toy but rather a highly detailed static model designed and produced for collectors. A fully detailed model of a W6 Melbourne. HO/OO gauge or 1:76 scale. 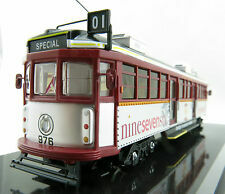 This model depicts the City circle tourist tram 'No. 888' - known as the "Lucky Tram". Fully working ELECTRIC model with interior lighting and bi-directional working headlights. Outstanding packaging. SCALED SPEED TO 50 KPH. There are only 400 pieces made worldwide. 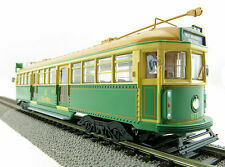 A fully detailed model of a W6 Melbourne Tram THE "GREEN RATTLER". HO/OO gauge or 1:76 scale. MMTB VERSION Car NO. 965. Fully working ELECTRIC model with interior lighting and bi-directional working headlights. Outstanding packaging. SCALED SPEED TO 50 KPH. There are only 400 pieces made worldwide. THE BOGIES ARE TURNING AND THE WHEELS WILL FIT ON OO/HO TRACK. 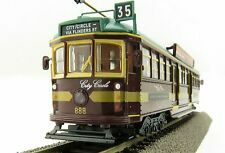 This model depicts the City circle line tourist tram 'No. 888' - known as the "Lucky Tram". HO/OO gauge or 1:76 scale. Model does not have a motor ! Item are listed with GST included. GST is not applicable to international orders. 1:76 DIECAST MODEL OF A W6 CLASS TRAM THE "GREEN RATTLER"! MMTB VERSION Car NO. 965. The model is displayed compare to previous versions in an acrylic display case. There are only 400 pieces made worldwide. THIS COLLECTOR MODEL IS NOT ELECTRIFIED. THE MODEL EVEN HAS THE CORRECT SEATING INSIDE. THE ELECTRICAL CONDUCTOR POLES RAISE AND LOWER. THE BOGIES ARE TURNING AND THE WHEELS WILL FIT ON OO/HO TRACK. 1:76 DIECAST MODEL OF A W6 CLASS TRAM THE "GREEN RATTLER"! MMTB VERSION Car NO. 965. The model is displayed compare to previous versions in an acrylic display case. Model does not have a motor ! Hornby MidiMat (1600 x 1180mm). Loco Class B17. BR MK1 Corridor Composite Coach. BR MK1 Brake 2nd Class Coach. Item are listed with GST included. GST is not applicable to international orders. Bank Deposit. Bachmann UK 30-165 The Thanet Flyer Southern Railway Train Set. OO/HO Scale - DCC Ready for a 6 pin decoder. This item is number X146 of a limited production run of 250 pieces. This item has never been out of the box and has been in our warehouse since it was imported from Bachmann UK. This item is no longer available from Bachmann and is very hard to find in this condition. DCC Ready 2 Rail DC. 31-967 Class A4 'Dominion of Canada' BR Green Late Crest. Include sitting on this tram models in Hong Kong transportation. Photos of the tram car model inside.